I love face masks as they breathe in freshness and softness in to my, otherwise dry skin. This is a new clay infused fabric mask, that is probably the best way to apply a clay mask, without worrying about creating a mess in your sink. I never like how the mud sits on the sink and had to be scrubbed off. Anyways, so this Red Earth Clay Spa Face Mask is made with Mediterranean clay and contains pomegranate extracts and cinnamon. Oh I love pomegranates and cinnamon! It feels delicious to have a delicious face mask that has the cleansing and tightening properties of clay. How did my skin feel with this one? Lets find out! I like how neat it was to use this mask. The fabric mask, infused with clay was quite moist. I followed instructions and let it sit on my face for 15 minutes and then I removed the mask and rinsed. My skin felt incredibly soft and clean in just a single use. I could really see my nose shining, although it did not cleanse out blackheads or whiteheads, but it did exfoliate skin thoroughly. The size of this mask was a bit long for my face and there was extra fabric on my chin and forehead. 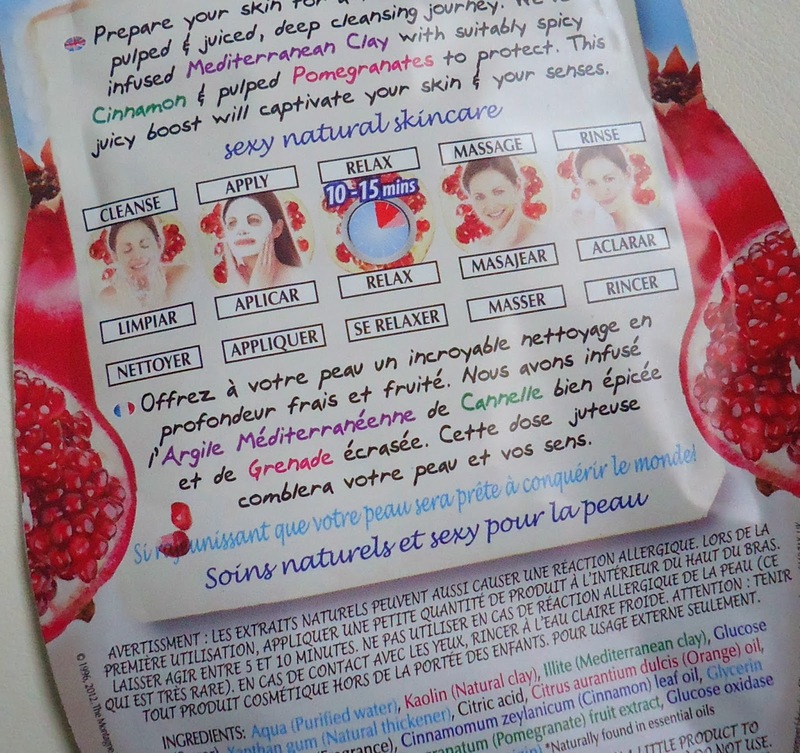 Other than that, the mask felt pretty comfortable on face and although this is a clay mask, its contains pomegranate pulp and cinnamon, that kept it moist for 15 minutes. I did not find the mask to be drying on my face, nor did I experience any reactions.